Posted Jul 25, 2018 by Eds. TruePublica Editor: In late May TruePublica predicted that Julian Assange was close to being arrested by the British authorities. The writing was on the wall. “Britain is doing Washington’s dirty work and given the heavily increased ‘political chatter’ on Assange’s fate–it is quite likely the British government is looking for public reaction to be muted enough to simply arrest him, go through the motions and send Assange to certain solitary confinement on death row.” Assange’s arrest now looks set to be just days away. Lenin Moreno travelled to London on Friday for the ostensible purpose of speaking at the 2018 Global Disabilities Summit (Moreno has been using a wheelchair since being shot in a 1998 robbery attempt). The concealed, actual purpose of the President’s trip is to meet with British officials to finalize an agreement under which Ecuador will withdraw its asylum protection of Julian Assange, in place since 2012, eject him from the Ecuadorian Embassy in London, and then hand over the WikiLeaks founder to British authorities. If sources close to the Ecuadorian Foreign Ministry and the President’s office, are correct, Greenwald asserts that Moreno has already done the deal to hand over Assange to the UK, possibly as early as within a week. The withdrawal of asylum and physical ejection of Assange could come as early as this week. RT editor-in-chief Margarita Simonyan said, citing her own sources from just two days ago, “My sources tell me [Julian] Assange will be handed over to Britain in the coming weeks or even days.” Simonyan wrote in a recent tweet which was reposted by WikiLeaks. “Like never before, I wish my sources were wrong,” she continued. In late July, the Times reported Britain is locked in top-tier discussions with the Ecuadorians in a bid to remove Assange from its London embassy. In addition, Sir Alan Duncan, the Foreign Office minister, is said to be spearheading the diplomatic effort from within. For the last eight years, the UK has refused to either confirm or deny that they have received an extradition request from the U.S. In addition, a British tribunal has refused to release any documents pertaining to the reasons as to why Assange has remained in an effective prison, at taxpayers expense, on the grounds that it had to protect the British Prosecution Service’s relationship with foreign authorities–in this case, the USA. Once in the hands of the British police, Assange would immediately be imprisoned. There, Assange could spend years locked in legal battles fighting U.S. extradition as no British judge would defy the government in this case and release Assange on bail. 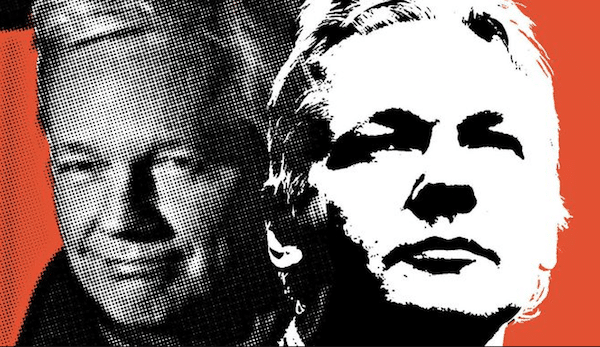 If the UK and U.S. government succeed in keeping Assange imprisoned for years to come, all due to its attempts to prosecute him for publishing classified documents, then the mainstream media and British citizens should know one thing for sure–the false arrest and imprisonment of Assange marks the end of what is left of press freedom in Britain. Along with secret courts, sweeping police powers and mass illegal surveillance systems, all this does is add the final straw in the continuing destruction of civil liberty, confirming Britain as no more than any other rogue state that flouts international legal norms to protect the political elite from its own wrong-doing. The U.S. has gone as far as saying that Assange was “engaged in terrorism,” with the Attorney General, Jeff Sessions, last year calling his arrest a “priority.” Over the years, WikiLeaks has published hundreds of thousands of classified U.S. files, including the cables on the Iraq War, leaked by whistleblower Chelsea Manning in 2010. This was, of course, an embarrassment to the UK government and many current serving politicians who voted for the war in Iraq–proven now to be Britain’s worst foreign policy decision in modern history.